Take Shelter is a supernatural drama starring Michael Shannon and Jessica Chastain as Curtis and Samantha LaForche, a husband and wife feeling the strain of some troubling revelations. A character study about mental illness as well as a supernatural mystery, this film follows Curtis as he struggles to accept his affliction. Gradually neglecting his job, his friends, his wife and his daughter in order to work on a sunken storm shelter made from a shipping crate in the family's backyard, Curtis begins to wonder if his compulsion to complete this project is sensible or a manifestation of schizophrenia. Throughout the weeks following, Curtis begins to see apocalyptic omens forecasting a huge cataclysm and this causes him to become more determined to finish the shelter so that he can protect and preserve his family as best he can, even as they worry more and more about him. Due to the fact that their daughter is deaf, Samantha tries her best to support Curtis while attending to the special needs of their child. While Curtis doggedly pursues this delusion, Samantha is having trouble keeping up appearances with their friends, family and community, struggling to pay bills due to Curtis' increased absences from work. When he realizes how differently everyone sees him, he decides to confront what he's most afraid of - that he has inherited schizophrenic hallucinations from his mother, who is permanently housed at a mental health facility. As he increasingly becomes agitated, alienated and paranoid, he decides the moment has come and hurries his family into the shelter, finally vindicated at what he's suspected all along. When the storm passes, Curtis must decide whether his determination was worth the sacrifice of his well being and family stability. 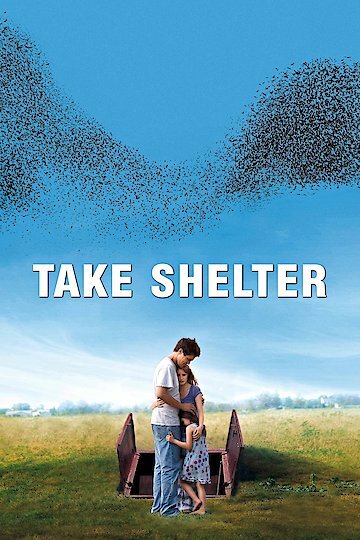 Take Shelter is currently available to watch free on Crackle and stream, download, buy on demand at Amazon Prime, Amazon, Vudu, Google Play, FandangoNow, iTunes, YouTube VOD online.